In India, there are Hindu women who shave all of the hair from their heads. These religious pilgrims—many of them peasant women—offer up their long, black tresses as a religious sacrifice. It is an opportunity to both renounce the ego and express gratitude for the blessings they have received from the gods. Later, the locks are sold—sometimes overseas to America, where they are in high demand—and the hair is then styled into wigs and hair extensions for women who wish to augment their beauty. It is hard to imagine a woman in poverty giving thanks for the blessings she has received. It is especially hard to imagine when another woman on the other side of the globe examines the silkiness of various hair extensions with the ends of her hot pink, acrylic nails, struggling to decide which set of strands she will purchase. The sacrifices of the smooth-headed Indian women are a reminder of blessings taken for granted, and the subjective lenses that filter our world-views through various shades of light and shadow. This week Granta published “Accident,” a new short story by the critically-acclaimed Israeli author, Etgar Keret, that explores the notion of persistent hope amidst despair, and the way that the relative nature of tragedy often works to remind us of our own blessings. (If you plan to read the story, but not now, beware: the rest of this post has spoilers). In the story, a man travels in a cab from Beersheba to Tel Aviv. The night before, his wife nearly died of a miscarriage, and three days earlier, the narrator learned that his father’s cancer has returned, and the only way to fight the tumor effectively would be to remove the tongue and the larynx, which would render the father unable to speak or eat. Meanwhile, the cabbie has his own problems—he’s never had a wreck in 30 years, but he’s recently been in a minor fender-bender, and the guy he hit tires to cheat him out of 200 shekels (about $50) which he says he doesn’t owe. Finally the narrator, consumed with his own anxieties, boils over, and screams at the cabbie, telling him of his own problems. Now the cab driver understands, and tries to get directions to Tel Aviv by parking in the right-most lane of the highway rather than on the side. The narrator waits in the car—and smash—glass shatters around him, cars fly, and the narrator is in the back of an ambulance. When his father calls, asking him how he’s doing, he doesn’t tell him that he’s in the hospital, that his wife has had a miscarriage, that he’s been in an accident. Instead he lies, telling his father that they’re at home, that his son is tucked in bed already. His father was a Holocaust survivor, and the trauma of the event—still a living entity some 70 years later—makes life itself into a blessing, even if it brims with tragedy. 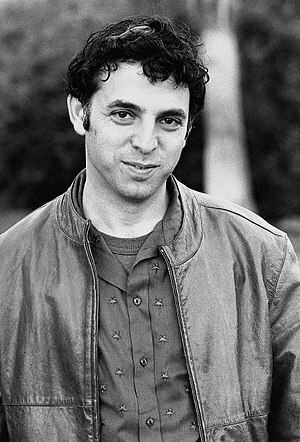 In an interview from Critical Mob, Tracy O’Neill questioned Keret on the role chance played in the lives of the characters that populate his fiction, and to what degree these individuals have the ability to control their own fates. To what extent does anybody control his destiny? Life is very much like falling of the edge of a cliff. You have complete freedom to make all the choices you want to take on your way down. My characters choose to yearn and not lose hope even when the odds are completely against them it doesn’t make the landing at the end of that fall any less painful but, somehow, it helps them keep a little dignity their bone broken body. What seems to be operating within this text, too, are varying levels of communication and expression. The cabbie spews complaints about his fender bender, and yet the pain the narrator faces at the loss of his unborn child that for most of the ride, he cannot say anything: he is rendered speechless by the depth of his grief. A sculpture in memory of the Holocaust in Tel Aviv University (TAU). The narrator in “Accident” works at a university. The father, soon-to-be most silent of all, after his surgery, has suffered most of all, yet he does not complain as the cabbie does, but instead avoids speaking of pain, lying to his son one day over the phone that he is at the grocery, instead of at the hospital, just as his son deceives his own father in the end, too. Throughout the story, Keret reiterates in subtle intonations that tongues should be waived in gratitude, rather than complaint—that every syllable should be an expression of thanks, a words of recognition for every blessing, even if it is cloaked in tragedy.